Having a gluten intolerance, I have brushed people off when they ask if I have Celiac Disease. “I don’t have tummy issues. It’s more mental” I would say. 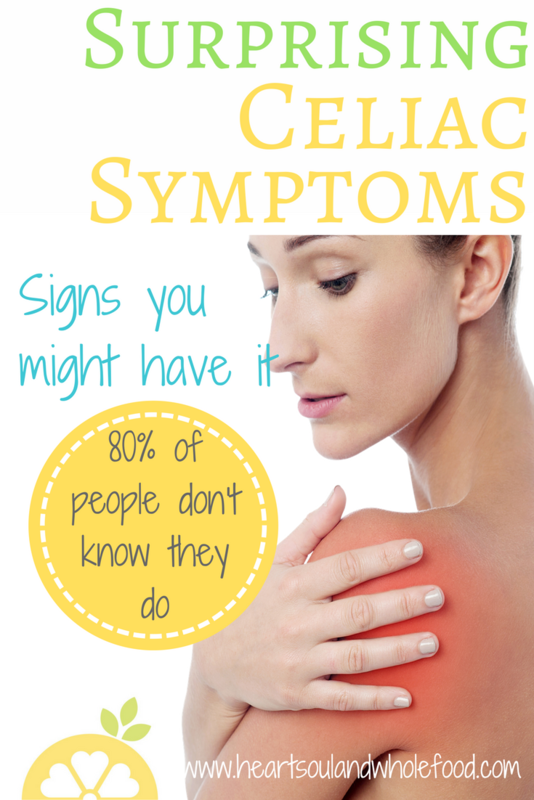 Taking the time to dig deeper I am shocked by the potential Celiac symptoms. After briefly learning about Celiac Disease, the majority of what I read was all about diarrhea, stomach pains, weight loss (no problems here!) and other intestinal issues. Because this is what I had been reading and researching, I didn’t think CD was something I needed to worry about. However, the more I have dived into the subject, the more I really think Celiacs is actually a possibility for me. If you missed my post on my gluten intolerance symptoms you can read it here: Gluten Intolerance Symptoms. If you have someone with Celiac Disease already in your family than your chances are 1 in 10 of having it as well. You may also just carry the gene, but never have it active. It’s also more common in people with other diseases like Downs Syndrome, Type 1 Diabetes, Turner Syndrome and Rheumatoid arthritis. These things may mean you are more prone to the disease. However, even if none of these are present, your odds are still pretty good. In fact it’s estimated that approximately 80% of Celiac Disease sufferers are going undiagnosed. Having gone through all I did, I can see this as being true seeing as how I think I went through most of my life ignoring the symptoms. Fatigue – Similar to my symptoms, people struggling with Celiac may experience excessive exhaustion no matter the amount of sleep. These may set in immediately after consuming gluten or just be always present. Migraines or seizures – So many people suffer from migraines these days, and similar to the anxiety and depression associated with CD, migraines are another way of your CNS communicating to you that something is wrong. Missed periods – This one, to me, is a very serious matter. Missed periods is one thing but miscarriages have also been potentially linked to CD. Doctors recommend if you continue to experience these symptoms, to get checked for CD as a potential factor. Canker sores – Sores in the mouth is another symptom of CD. Itchy Skin – If you are experiencing itchy, blistering skin particularly on the elbows, knees, stomach, head and bum it might be a sign of CD as well. Here is a great check list you can go through if you are concerned that you may have Celiac. Celiac Check List. There is one more type of Celiac sufferers who have what’s called “Silent Celiac Disease.” This group of people experience no noticeable symptoms but will have damage to the small intestines that take place gradually over time. In order to be diagnosed with Celiac Disease, you must be still consuming gluten at the time of testing. Your doctor can run a blood test first and potentially do a small bowel biopsy to assess any gut damage. There are no medications or drugs to aid with Celiac Disease. The treatment is simple, yet incredibly difficult. I am a firm believer in avoiding medication if at all possible. Celiac is great in the sense that it is one disease that can be treated without meds. If you are anything like I was, giving up grains won’t be easy. Yup, clearing your symptoms means cold turkey on all things gluten. It can be found in more products than you realize, including sauces, candies, and drinks. More and more stores are hopping on board with gluten free options. Including Thrive Market online. They have a great gluten free starter kit! Click Here for 25% off and FREE shipping on your first purchase. For some of my top recommended gluten free foods check my post all about it: Gluten Free Shopping List or take a peek at a few of these recommendations for gluten intolerant sufferers. If you suspect you may have Celiac Disease, be sure to consult your doctor and continue consuming gluten. Also, don’t fear, you can do this!